ATTLEBORO, Mass. – In the first round of last year’s Div. 1 South tournament, Attleboro faced Needham just a week after beating the Rockets for the second time in the season. Trying to beat the same opponent for the third time proved too much, as the Needham went on the road and upset Attleboro. Less than a week after beating Durfee for the second time this season, Attleboro opened this year’s tournament with a third game against the Hilltoppers. Junior forward Sarah Deyo admitted that the Needham game was on her mind as she prepared for Tuesday’s match-up. Deyo almost single-handedly ensured there would be no repeat of last year’s upset. She scored 25 points and dominated the glass, pulling in 17 rebounds, as the Bombardiers held off a second half charge to beat Durfee 57-44 and advance to the sectional quarterfinal. Attleboro got off to a slow start, handing Durfee a quick 5-0 lead, but then Deyo started to go to work. She scored off a Sam Pierce assist, followed by a three from Emily Houle, and then managed to corral a loose ball for a layup and score off an offensive rebound. She had seven in the first and finished the quarter with an assist on a jumper by Grace Mayer. Deyo continued the good work in the second, adding another nine points including a perfect 7-7 from the line (she was 8-9 from the line in the first half but 1-7 in the second). Houle chipped in with five of her 11 points, including a step-back three that was quickly followed by another long-range shot by Fatima McDonald. Attleboro led 29-19 at the half and things felt like they were falling into place for a comfortable win, but in the third quarter (as they did last Wednesday) the Hilltoppers made a charge. Jordyn Gauvin (team-high 16 points) scored five in the third and a Reagan McDonald jumper got Durfee as close as five points at 37-32. The Bombardiers needed a spark in the third quarter and were not finding success going through the usual troika of Deyo, Houle, and Pierce, so in stepped senior forward Emma Vlashi. Another player that missed time this season with injury, Vlashi stepped off the bench and provided instant offense, scoring eight of her 12 points in the quarter. She scored on a layup off a Deyo drop pass then on the break after a Mish Logie steal and assist and capped it off a great touch pass from Pierce across the paint. Deyo gave the hosts a little momentum heading to the fourth with an offensive rebound at the buzzer that extended the lead to 39-32. Houle followed that with a three on Attleboro’s first possession of the final quarter and Logie added another from the corner a few seconds later. The lead grew to 11 when Deyo scored plus the foul off an inbounds play, before Vlashi added her final four points to put the Bombardiers ahead 52-39 with time winding down. Deyo capped it with a pair of putbacks, as Attleboro crushed the Hilltoppers on the glass to pull out the win. “Last game they beat us on the boards both offensively and defensively, so a big aspect of the game was make sure we get the rebounds and don’t let them get second chance points,” said Deyo, who was helped on the glass by Houle with nine rebounds, McDonald with eight and Pierce and Valshi each with seven. The Bombardiers confidence will be put to the test when they host No. 5 seed Wellesley on Thursday night in the Div. 1 South quarterfinal. 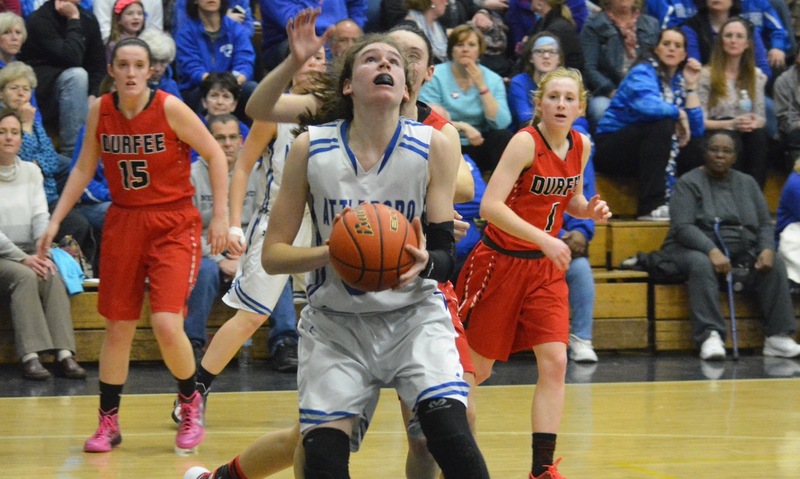 #4 Attleboro, 57 vs. #13 Durfee, 44 – Final – Sarah Deyo led the way for the Bombardiers with 25 points and 17 rebounds. Emma Vlashi came off the bench to score 12 points, all in the second half, and pulled in seven rebounds, while Emily Houle scored 11 and grabbed nine rebounds. Attleboro will host No. 5 seed Wellesley on Thursday. FALL RIVER, Mass. – In the fourth quarter against Mansfield on Monday night, with a standing room-only crowd packed into the James Albertini Gym providing an atmosphere unlike any other girls’ basketball game this season, Emily Houle rose up in the fourth quarter for a baseline jumper to try and tie the game. The ball seemed to be at least halfway down, before it spun back up and out. As the final seconds wore down on an eventual Mansfield win and with Houle stuck at 998 career points, some wanted the Hornets to allow a layup and let her achieve the milestone. That did not happen and Houle was back in action again on Wednesday night against Durfee at the Luke Urban Field House and a strong traveling contingent of Attleboro fans had made the 30-minute the trip to Fall River with signs, balloons, and plenty of cameras to record the moment when the wait for history was over. The fans did not wait long. 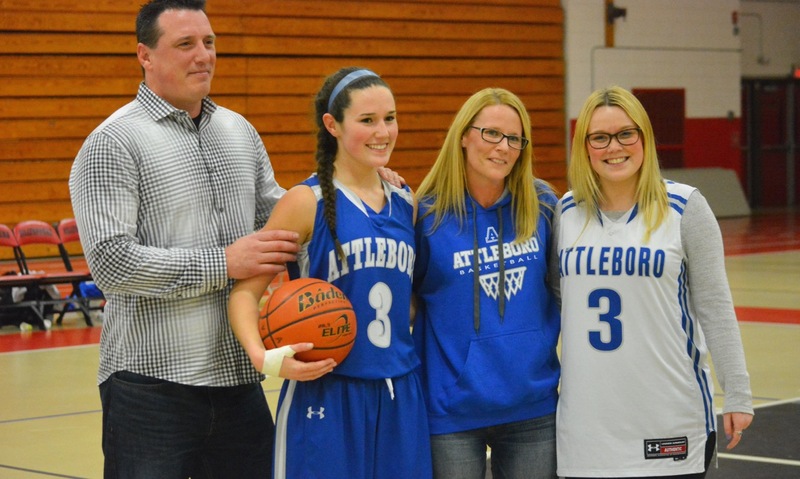 With 2:27 off the clock and the Bombardiers trailing 4-0, Houle drove to the basket and banked in a runner to become the fifth girls’ basketball player in Attleboro history to reach 1,000 points and the first since Sarah Wright in 1999. Her teammates stormed onto the court when the basket was made, surrounding her, before she broke off for photos with family and friends (and even a nice token from the Durfee team, which knew that she was chasing 1,000). The game took a few minutes to restart and the teams seemed to need a couple more minutes to get back into it, but there was a different feel about the Bombardiers, who head coach Rick Patch admitted had a weight lifted now that it was not worrying about the milestone. Houle has been a four-year varsity player, but she admitted that there was no way that she could have envisioned when she stepped on the floor as a freshman that some day she would be placing her name on the 1,000-point banner. “When I was a freshman, I was just happy to get out there and not dribble the ball off my foot,” Houle joked. Coming into the season as one of the league’s top returning scorers, many people around the Hock believed that Houle would be able to get the points she needed, but in just the second game of the season she went down with a knee injury that she worried could have put her high school career in jeopardy. Averaging nearly 17 points per game this season, as of stats compiled on Feb. 8, Houle did not allow the injury to slow her down. By helping to lead the Bombardiers to a winner-take-all showdown with Mansfield for the league title, she was voted the Hockomock MVP by the league’s coaches. There was also plenty of support from the Attleboro fanbase, which packed the gym all week after Houle scored 31 against Taunton to get the milestone within reach. The Bombardiers started to pull away before halftime on Wednesday, but a strong push in the third quarter by Isabel McDonnell and the Hilltoppers closed the gap to 33-31. Sam Pierce buried a three just before the end of the third and Attleboro ran away with a 19-7 fourth quarter to pull out a 55-38 win. 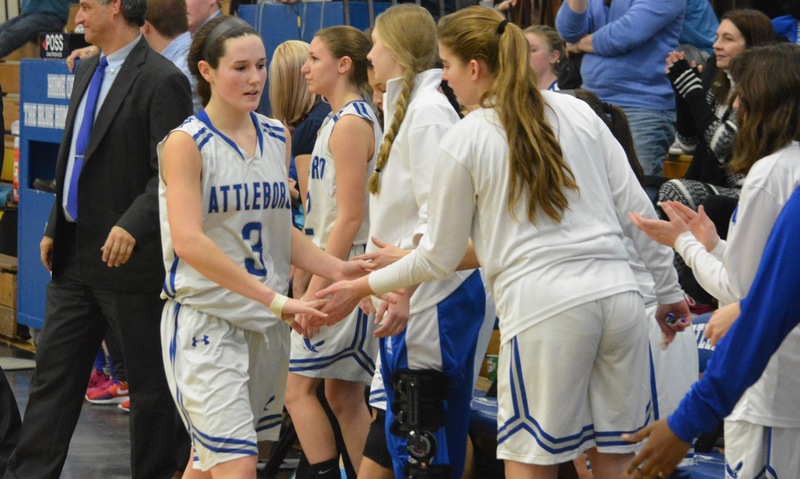 Sarah Deyo led the way for Attleboro with 16 points and Houle knocked down a fourth quarter three to finish with 13. It moved the Bombardiers to 20-2 on the season and could possibly see them host Durfee in the first round of the state tournament. Considering all of the success that Attleboro has had this season, Houle could easily shrug off the frustration of having to wait a game or two longer than she hoped to achieve her goal. MIAA basketball tournament pairings will come out on Friday. Attleboro, 75 vs. Durfee, 67 – Final – Junior Jake Dunkley scored a game-high 19 points and pulled in nine rebounds, junior Andrew Milliken added 16 points, sophomore Nate Douglas chipped in with 12 points, senior Brent Cook had 10 points and six rebounds, junior Berlyns Abraham scored 10 points and finished with seven rebounds and senior Kyle Murphy had five points and 12 rebounds. Mansfield, 58 vs. BC High, 44 – Final – Mansfield raced out to a 15-4 lead after the first quarter and never looked back. Matt Ehrlich had a team-high 16 points, Max Boen scored 13 points and Sam Goldberg had nine points and nine rebounds. Attleboro, 55 @ Durfee, 38 – Final – Sarah Deyo led all scorers with 16 points for the Bombardiers, while Emily Houle added 13 and with a first quarter layup became the fifth Attleboro girls’ basketball player (and first since 1999) to reach the 1,000-point plateau. The Bombardiers closed with a 22-7 run after Durfee cut the lead to just two at 33-31 in the third quarter. Foxboro, 53 vs. Bridgewater-Raynham, 41 – Final – Ashley Sampson led the way with 12 points while Kristen Bortolotti added 11 points for the Warriors. MANSFIELD, Mass. – Four years ago, Mansfield won only four games. Those freshmen are now seniors and on Monday night, they capped their final season in Mansfield colors by climbing a ladder, scissors in hand, to cut down the nets at the Albertini Gym. The Hornets used a strong second half to exact a measure of revenge on Attleboro with a 56-43 victory in front a standing room only, raucous crowd to split the season series with the Bombardiers and clinched the Kelley-Rex division title. It is the program’s second Hockomock title and first since 2011. Attleboro came into the game with its sights set on the program’s first Hockomock title and jumped out to an early lead, up 12-8 after the first quarter. Junior Sarah Deyo sparked the Bombardiers with seven of her team-high 15 in the first, including an early three and a couple of layups. Juliana Newell (12 points) kept Mansfield in the game with four in the first and another six points in the second, most coming off her familiar mid-range jumper. Jen Peel stepped up in the second and scored half of her game-high 18 points in the quarter with drives into the middle of the Attleboro defense. A Jordyn Lako three had given Attleboro a 22-15 lead, but Peel scored five straight points to cut the lead to four. After a pair of free throws by Fatima McDonald, Peel got another layup and a pair from the line to bring Mansfield within two. After Sam Pierce (10 points) buried a three, Newell closed out the first half with a runner that kept the Hornets within three at 27-24. In the third quarter, Meg Hill took over the game. The sophomore center scored all 11 of her points in the third and a big chunk of her game-high 15 rebounds and four blocks. Hill started the half with a layup off an inbound pass by Peel (five assists) but Mish Logie followed with a corner three to extend the lead to four. Peel answered that with a transition basket plus the foul. After a Pierce jumper, Hill scored four straight to give Mansfield the lead at 33-32, its first since the opening basket of the game. She continued to dominate the paint on a personal 8-0 run that put Mansfield up by five, a lead that the Hornets would carry into the fourth quarter. Deyo hit a three late in the third quarter and then added another one to start the fourth and bring Attleboro back within two. After a Newell layup and a pair of free throws from Jackie Carchedi, Emma Vlashi (six points) scored on a drive to the hoop and another shot in the paint and it was 45-43. Coming into the game, Emily Houle needed four points to hit 1,000 for her career, but in the fourth quarter she had been held to only a pair of free throws. At several points in the game, Houle seemed more like a decoy as the offense flowed in different directions, but she finally got free on the baseline with a chance to tie the game. The jumper was halfway down but spun out. Attleboro did not score another point in the game. “It’s baffling,” said Patch about the struggle to get Houle the ball. “We’re coming out of timeouts calling certain plays and I don’t know if it’s the environment or whatever, we trained for it, we practiced for it. Mansfield forced a steal from McDonald and Peel raced the length of the court to score plus the foul, putting the Hornets up by six. On the next trip, Carchedi took a deep three that was off line, but the senior was the first to react and rebounded her own miss to score a dagger basket. The Hornets knocked down free throws in the closing minutes to clinch the victory and with it the title. Maher got her wish and was able to stand atop the ladder and hold her piece of the net. Mansfield will await the tournament pairings that will come out this weekend, while Attleboro will close out its regular season (and Emily Houle will continue her quest for 1,000) on Wednesday at Durfee. ATTLEBORO, Mass. – The crowd was packed in behind and across from the Attleboro bench, with balloons, signs, and more celebrating senior guard Emily Houle and her quest to become the first female to score 1,000 career points for Attleboro since Sarah Wright in 1999, which she needed 21 to attain on Friday afternoon in her final home game of the regular season. Houle scored 17, all in the second half, so the full celebration will have to wait until Attleboro’s game at Mansfield on Monday night, but the Bombardiers had enough in reserve to avoid the trap of facing non-league Dartmouth after a week off and three days before the game that will decide the Kelley-Rex title. Attleboro struggled early on against Dartmouth’s triangle-and-two defense but managed to pull out a 48-36 victory on an afternoon that ended with very little attention being paid to the final score. The Indians, playing less than 24 hours after a loss at Mansfield on Thursday night, started the game with Cali Andrade doing her best to deny Houle the ball. 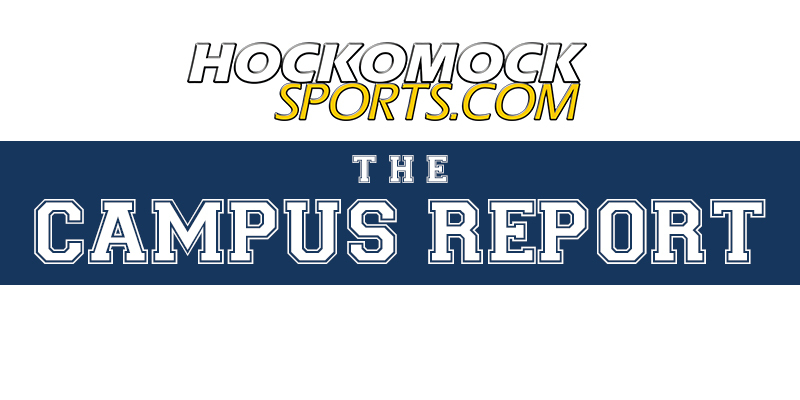 With the Bombardiers trying to get Houle the ball as often as possible to help her get to the milestone, Attleboro’s offense bogged down in the first quarter and the top scoring team in the Hock was held to just six points. Senior guard Fatima McDonald (eight points) was Attleboro’s lone source of offense, scoring all six points in the first, including a drive to the hoop and a three. In the second, sophomore Sam Pierce chipped in with four of her 10 points and Grace Mayer and Mish Logie each contributed layups. At halftime, the Bombardiers trailed 17-14 and needed to find an answer to all of the attention being put on Houle and Sarah Deyo (seven blocks, 10 rebounds). “I thought if we’re not careful this could get away because a similar thing happened at Stoughton when we were down a bunch of players,” said Patch. In the third quarter, the Bombardiers clamped down on defense. Kelsey Shurtleff (team-high 12 points) knocked down a pair of threes but the Indians were no longer getting anything inside and Attleboro took control of the glass. A McDonald layup and a Deyo putback pulled Attleboro within one at 19-18, then Pierce assisted on a Logie three that once again cut the lead to one. In transition Houle finally got on the board with a layup that gave Attleboro its first lead since it was 2-0. Pierce added to it with a basket on an inbound and a steal and layup. Houle (11 rebounds) tacked on a three off a missed Dartmouth free throw and then another bucket in transition that had the crowd on its feet and pushed the Attleboro lead to 34-25 heading to the fourth. 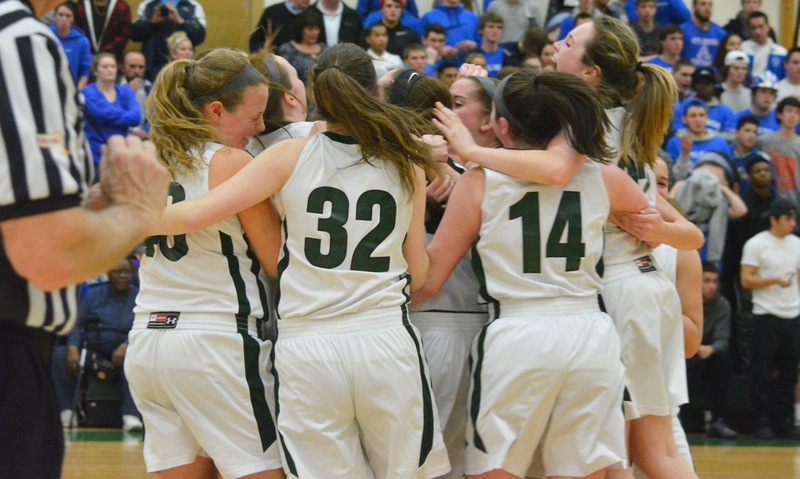 Dartmouth scored the first four points of the final quarter to hang around, but Attleboro broke the game open with an 11-0 run, including seven points from Houle that put her at 14 for the night and needing seven points in three minutes to reach 1,000. With Attleboro leading by 16 at 45-29, the focus of both benches turned to the impending milestone. The Indians turned to a four corners offense in the closing minutes, clearly with no intention of trying to mount a comeback and purely interested in limiting Attleboro’s offensive possessions. Meanwhile, the Bombardiers were fouling intentionally to put the Indians on the line so they could then get the ball back. Now the focus will turn to Monday night and the matchup with Mansfield that will determine the league title. The boys’ game against the Hornets has been moved up to 5 p.m., while the girls’ start was pushed back to 7:15 to allow both fanbases to see the league finale (and cheer Houle when she reaches 1,000). Milford, 48 @ Foxboro, 66 – Final – Foxboro senior Alex DuBrow scored all of his team-high 16 points in the second half, adding eight assists and five rebounds. Jason Procaccini had 15 points, eight rebounds and three assists, Rob Lowey had 15 points and nine rebounds and junior Mark Clagg finished with 10 points. Milford’s Dimitry Torres scored a game-high 18 points along with six assists. Franklin, 64 @ Catholic Memorial, 87 – Final – Senior Tim Prunier and freshman Jay Dieterle each had nine points for the Panthers. Taunton, 84 @ King Philip, 60 – Final – Taunton senior Jose Mercado poured in a career-high 31 points while Tommy MacLean had 14 points and Dom Smith added 12 points. King Philip’s Pharoah Davis had a team-high 13 points. Attleboro, 48 vs. Dartmouth, 36 – Final – Emily Houle led the way for Attleboro with 17 points, all in the second half, which leaves her four points shy of 1,000 for her career. She also had 11 rebounds. Sam Pierce added 10 points and 11 rebounds for the Bombardiers, Fatima McDonald had eight points, and Sarah Deyo had only three points but chipped in with seven blocks and 10 boards. Canton, 47 vs. Blackstone-Millville, 42 – Final – The Bulldogs swept the season series with BMR behind 14 points from Hannah Jerrier and eight apiece from Jess Powers and Meaghan Hunter. Canton turned the game around with a 30-13 second half. King Philip, 38 @ Taunton, 37 – Final – Jen Lacroix scored all 12 of her points in the second half to lead the Warriors, who bounced back from a 12-point halftime deficit. Sam Madden added eight points for KP and Riley Dalzell had 10 rebounds. Taunton was led by Alyssa Gibson, who finished with 13 points and 14 boards, and Lily Patneaude, who scored 11 points. Milford, 44 @ Foxboro, 61 – Final – The Warriors had three players reach double figures, led by Ashley Sampson’s 14 points. Cassidy Harrison added 11 points and Kristen Bortolotti had 10 points. North Attleboro, 47 vs. Durfee, 34 – Final – The Rocketeers were led by junior Caroline Collard with 10 points and Ashley Ahern chipped in with six. Sharon, 43 @ Fontbonne, 58 – Final – Senior Alyssa Piazza had 19 points, six rebounds, and five steals for the Eagles in the loss.